Received May 17, 2018; Revised June 8, 2018; Accepted June 8, 2018. X-linked juvenile retinoschisis (XLRS) is characterized by the progressive loss of visual acuity and vitreous hemorrhage. XLRS is caused by a mutation of retinoschisin 1 (RS1) gene at Xp22.13. In the current report, a 2-year-old Korean patient with XLRS was described. The germline deletion of exon 1 was identified in the RS1 gene. Considering X-linked inheritance pattern, validation of a carrier state of a patient’s mother is important for the genetic counseling of other family members and for the future reproductive plan. 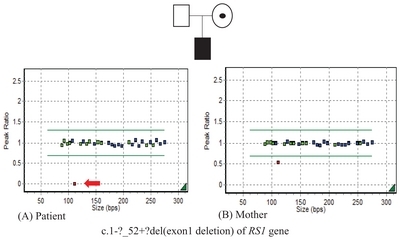 To confirm the carrier state of his mother, the multiplex ligation-dependent probe amplification analysis was done using peripheral leukocytes and found the heterozygous deletion of exon 1 in his mother. X-linked juvenile retinoschisis (XLRS) of hereditary type (OMIM #312700) is one of the most common causes of macular degeneration and is characterized by bilateral vitreous-retinal dystrophy. XLRS is caused by a mutation in the retinoschisin 1 (RS1) gene . Its incidence rate in males is 1:5,000 to 1:25,000 . The RS1 gene is located at Xp22.13 encoding retinoschisin that is involved in the development and maintenance of the retina secreted from photoreceptor cells and bipolar cells of the retina . Most patients with XLRS suffer from hyperopic astigmatism and decreased visual acuity since their first decade of lives . Diagnosis of XLRS is based on fundus abnormality, electrophysiological findings, and family histories that are consistent with X-linked inheritance and identification of a RS1 mutation . Several Korean patients have been reported carrying the RS1 mutations [4–7]. In this report, we described a patient with exon 1 deletion of the RS1 gene. Considering X-linked inheritance pattern, validation of a carrier state of a patient’s mother is important for the genetic counseling of other family members and for the future reproductive plan. Exonic deletion in a carrier is not easy to identify when an appropriate commercial kit is not available. In this report, we did the multiplex ligation-dependent probe amplification (MLPA) analysis using peripheral leukocytes and confirmed the carrier state of the patient’s mother. The patient was the first baby of non-consanguineous Korean parents. He was born after 41 weeks of gestation, 3,350 g. Pregnancy, labor and spontaneous vaginal delivery were uneventful. His growth and development had been unremarkable. At age of 2 years, he had his right eyebrow hit the edge of the table. After 1 year, at age of 3 years, abnormal focus of eye and gaze were noted. Fundus examination revealed vitreous hemorrhage in both eyes at the local ophthalmologic clinic, which was thought as developed due to the previous trauma. One month later, he was referred to Asan Medical Center due to the persistent vitreous hemorrhage. The detailed fundus examination revealed bilateral vitreous hemorrhages, inferior ghost vessels, and retinoschises. The examination by RetCam wide-field digital imaging system (Natus Medical Inc., Pleasanton, CA, USA) and fluoroscopy showed bilateral vitreous opacity retinoschises (Fig. 1). Bilateral peripheral retinoschises were also noted, and the right side was more severe than the left side on optical coherence tomography (Fig. 2). Informed consent was obtained from his parents, and blood sample was collected from the patient. Genomic DNA was extracted from peripheral blood leukocytes using a Puregene DNA isolation kit (Gentra, Minneapolis, MN, USA). All coding 6 exons and exon-intron boundaries of the RS1 gene were directly sequenced by an ABI 3130 Genetic Analyzer (Applied Biosystems, Foster City, CA, USA) using a BigDye Terminator cycle sequencing kit (Applied Biosystems) in the patient’s peripheral leukocytes. Polymerase chain reaction (PCR) amplification was not possible for exon 1, which suggested the exon 1 deletion in this patient. For the genetic counseling for his family members, it was important to validate the carrier state of his mother. MLPA kit was not commercially available but SALSA Reference Kit, probe X519-A1 RS1 was kindly provided from MRC Holland, Amsterdam, the Netherlands. The MLPA was done according to the manufacturer’s instructions. Amplified products were separated using ABI 3130 Genetic Analyzer and analyzed by Gene Mapper Software (Applied Biosystems). Complete exon 1 deletion (c.1-?_52+?del) in patient was identified (Fig. 3A). Patient’s mother also had heterozygous deletion of exon 1 as a carrier (Fig. 3B). XLRS is a macular degeneration that mostly affects males early in their lives . Most common characteristic features of XLRS is decreased visual acuity by invasion of foveal area, retinal splitting and most of patients were frequently diagnosed prior to school age . The hall mark of XLRS is the presence of a spoke-wheel pattern in the macula on high magnification ophthalmoscopy . Approximately 80% of patients have additional peripheral retinoschisis which helps to differentiate with other diseases . Our patient complained bilateral poor vision at age of 3 years. Fundus exam showed old floating vitreous hemorrhage, flat posterior pole on both eyes. Detailed examination showed only peripheral retinoschisin on lower part of retina. The RS1 mutations are responsible for XLRS. This gene consists of 6 exons and encodes 224 amino acids that produce a protein called retinoschisin, 24 kDa. Retinoschisin is highly expressed in retina and helps the retina inner surface to adhere to each other, involved in the development and maintenance of the retina . Therefore, RS1 gene mutations generate retinal tearing leading to the vision problems . In previous reports, the most common mutations in the RS1 gene has been missense (75%) mutations. Nonsense, small frameshifting insertions/deletions and splice site mutations account for the remaining 25% of the mutations. Exonic deletion has been reported as rare [10,12,13]. A total of 17 XLRS case reports have been reported in Korean population . RS1 mutations were identified in 14 patients (12 missense mutations and 2 splice-site mutations) and 8 mutations were found in exon 6 . MLPA analysis is a useful test for the detection of small exonic deletions. By its semi-quantitive nature, MLPA can reveal the heterozygous deletion as in our patient’s mother. Quantitative genomic PCR can also be considered as a test to identify the heterozygous exonic deletion even though it gives less accurate results compared to MLPA analysis. Because knowing the genetic carrier status is important in establishing the future reproductive plan, we used the MLPA method and found out the carrier state of patient’s mother. This research work was supported by research funds from the National Research Foundation of Korea (NRF-2015K1A4A3046807). (A) Right eye. (B) Left eye. Wide-field fundus photography (above) and RetCam fluorescein angiography (below; Natus Medical Inc., Pleasanton, CA, USA). Peripheral retinoschisis were found on both eyes at lower part of retina (right>left). 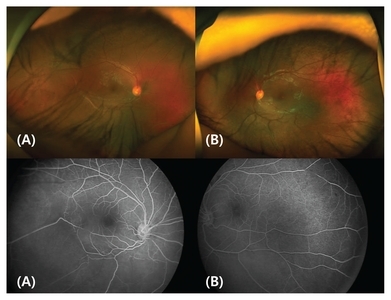 Fluorescein angiography showed hypofluorescence due to retinal schisis. (A) Right eye. (B) Left eye. On fundus photography, fovea showed typical pattern of a spoke wheel pattern. Spectral domain optical coherence tomography showed splitting of multiple retinal layers. The results of multiplex ligation-dependent probe amplification analysis using SALSA Reference Kit, probe X519-A1 RS1 (MRC Holland, Amsterdam, the Netherlands). Most line inclusions are marked. However, the peak ratio of exon1 on RS1 gene with 111.6 bin size in X-chromosome is 0% (arrow in A) in patient. Therefore, we know that the patient had exon1 deletion of RS1 gene in X-chromosome and his mother was heterozygote carrier. Madjarov, B, Hilton, GF, Brinton, DA, and Lee, SS (1995). A new classification of the retinoschises. Retina. 15, 282-5. Sikkink, SK, Biswas, S, Parry, NR, Stanga, PE, and Trump, D (2007). X-linked retinoschisis: an update. J Med Genet. 44, 225-32. Huang, CT, Chen, SP, and Tsai, RK (2015). The gene mutation in a Taiwanese family with X-linked retinoschisis. Kaohsiung J Med Sci. 31, 309-14. Li, X, Ma, X, and Tao, Y (2007). Clinical features of X linked juvenile retinoschisis in Chinese families associated with novel mutations in the RS1 gene. Mol Vis. 13, 804-12. Ma, X, Li, X, and Wang, L (2008). Novel XLRS1 gene mutations cause X-linked juvenile retinoschisis in Chinese families. Jpn J Ophthalmol. 52, 48-51. Shinoda, K, Ishida, S, Oguchi, Y, and Mashima, Y (2000). Clinical characteristics of 14 japanese patients with X-linked juvenile retinoschisis associated with XLRS1 mutation. Ophthalmic Genet. 21, 171-80. Kim, SY, Ko, HS, Yu, YS, Hwang, JM, Lee, JJ, and Kim, SY (2009). Molecular genetic characteristics of X-linked retinoschisis in Koreans. Mol Vis. 15, 833-43. Molday, RS, Kellner, U, and Weber, BH (2012). X-linked juvenile retinoschisis: clinical diagnosis, genetic analysis, and molecular mechanisms. Prog Retin Eye Res. 31, 195-212. Molday, LL, Hicks, D, Sauer, CG, Weber, BH, and Molday, RS (2001). Expression of X-linked retinoschisis protein RS1 in photoreceptor and bipolar cells. Invest Ophthalmol Vis Sci. 42, 816-25. Vazquez-Alfageme, C, Reinoso, R, Acedo, A, and Coco, RM (2016). 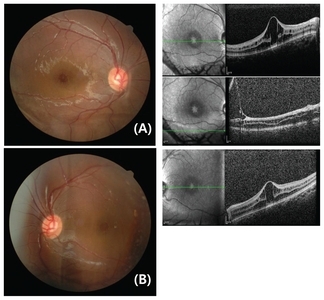 X-Linked retinoschisis associated to a novel intragenic microdeletion: case report. BMC Med Genet. 17, 5. D’Souza, LJ, Craig, C, He, H, Lee, JY, Antolik, C, and Li, S (2012). X-linked juvenile retinoschisis with novel exonic deletions in the RS1 gene. Invest Ophthalmol Vis Sci. 53, 4532. The Retinoschisis Consortium (1998). Functional implications of the spectrum of mutations found in 234 cases with X-linked juvenile retinoschisis. Hum Mol Genet. 7, 1185-92.